At first blush, she has the touch of detail that typifies Dutch artists. 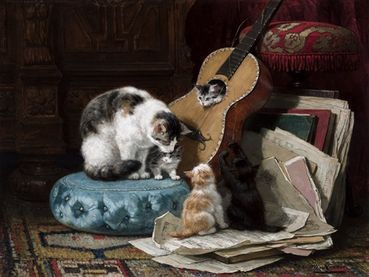 The immaculately detailed domestic settings; lovely, lush, alluring backgrounds; and richly textured motifs of the Dutch Masters are all there in the works of this female painter, but — Henriëtte Ronner-Knip infused her art with warmth and tender feelings, something that very few of the Dutch Masters ever did. The gentle sincerity of her emotion stands in stark contrast to the frankness of the Dutch Masters. 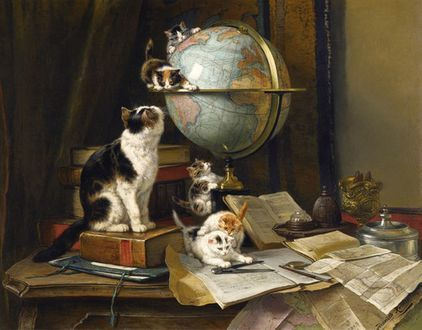 Whereas those Dutchmen painted the commissioned serious portraits of wealthy merchants in the thriving commerce class of the 17th-century Dutch Republic, Ronner-Knip painted playful, tactile portraits of cats, both humble and moneyed, of the 19th century. It is difficult to classify her work in terms of genre, or school, but the Romantic style in which she painted her animals, especially cats, casts her in the great tradition of Goya and Delacroix. Certainly her use of red places her in the group of painters who wished to express emotion, passion, and all of the grand drama of an era. There is not much drama, however, in the work of Ronner-Knip, just delicate beauty and the sweet sense of love that she felt for her subject matter. 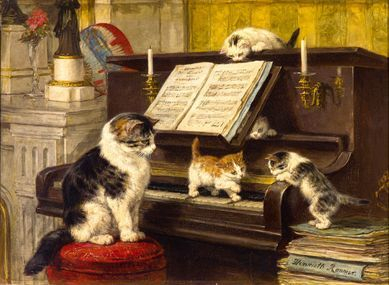 In all of her paintings, the refined formality of the setting is in obvious, almost comical, contrast to the adorable, playful, delightful cats who clearly enjoyed being the subjects of such a talented artist at work and, methinks, at play. This artist was born into a long line of painters on 31 May 1821, in Amsterdam. Her father, Josephus August Knip, was her first, and only, art teacher. It was he who provided this child with her first art lessons. Henriëtte began to paint as a girl, after having begun to draw at the age of five when she copied many studies and sketches from her artist-father. What a major lesson for any artist! It’s a truism for any person who wishes to live an authentic life, not merely to paint with one’s own vision. As this artist-father lost his eyesight, he trained his daughter to use her eyes artistically. It was a supreme example of tragedy being transformed into triumph, as well as into the ability to earn money: Henriëtte began to undertake the financial support of her family by the age of sixteen. 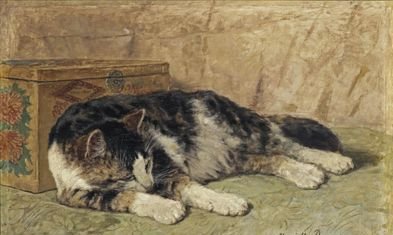 She exhibited her works at the annual art exhibition in Düsseldorf: a picture of a cat, positioned at a window, sold and Henriëtte Knip was on her way to the productive, profitable passion of painting for a living. Henriëtte would marry Feico Ronner in 1850 and become Henriëtte Ronner-Knip. She achieved the type of stature, acclaim, and recognition that an accomplished painter typically craves, through awards, medals, and honors from professional associations and from the royalty that existed at that time in Europe. Much of her subject matter was initially chosen by the royals who commissioned her work. It must have been a true joy for her to later be able to indulge her passion for animals, especially cats, through her art of painting. “The Cat Lady of Painting” is not an insult or a pejorative term. 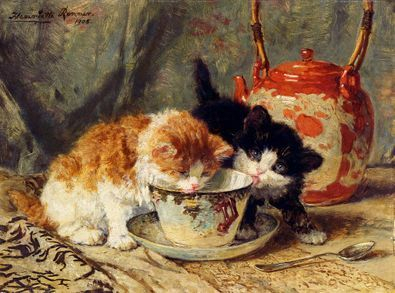 Ronner-Knip had painted still life, scenes of nature, and other subjects that display technical prowess, but those works did not exhibit the vibrantly abundant yet captivating enthusiasm that she felt for painting cats in the home. She was passionate about this work and she was therefore prolific. The approach of this woman toward the art of painting cats was systematic, almost methodical. She perceived her art as a project in depicting behavior, personality, and anatomy. She built a glass-fronted studio for her cats. There, they felt free to frolic and flit, to play as cats so love to do. She spent time with her cat-subjects, observing them, getting to know these living works of art, their mannerisms, attitudes, personalities. This painter sought to capture on canvas the beauty, grace, whimsical spirit, wondrous face and sensuous body of each cat. This time was an investment well-spent for both artist and subject. The artist transmuted her gentle love into her work. 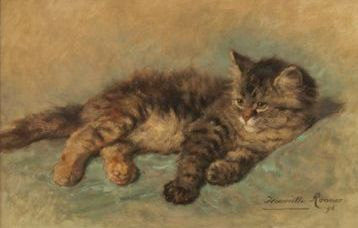 The cats rewarded their artist with endearing, enduring poses that she rendered, lovingly, in textures and in tones that elevated domesticity and animal portraiture to astoundingly touching arts. 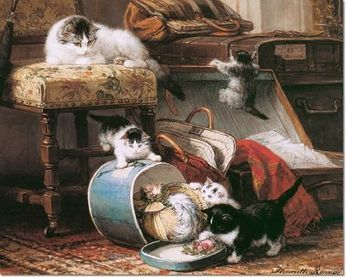 Henriëtte studied each cat to be painted as if it were a famous King or ostentatious Princess. She sketched and painted the subject with the disciplined dedication and quiet intensity that mark her as a true artist. 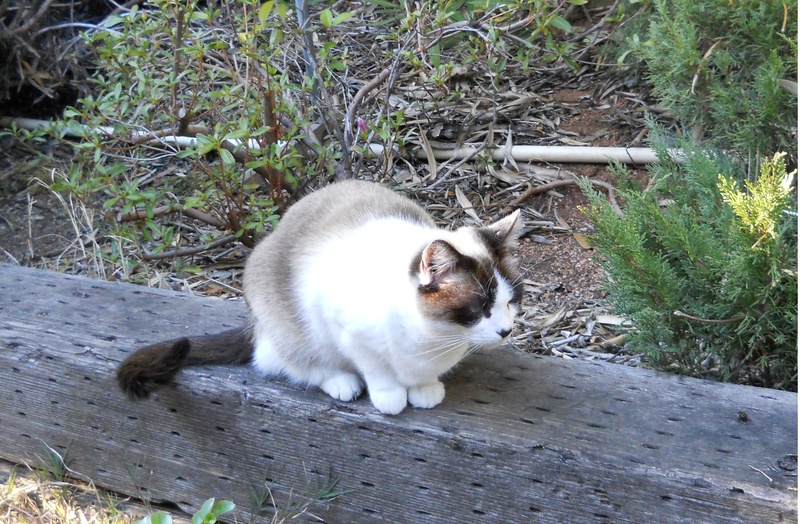 Cats were not her initial choice of subject matter. She’d painted scenes from nature, forests, and animals, working in watercolor and then in oils, and using a darker palette that was redolent of the Classical work of her father. Her decision to paint primarily cats came from necessity as much as from desire. 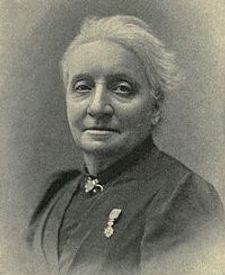 After moving with her husband, Feico Ronner, to Brussels in 1850, she became the primary wage-earner when her husband became ill and could not earn adequate money for the household. Her focus on painting cats, and dogs, then became the artistic answer to the question of survival. Her most famous works were produced after 1870, including lapdog portraits for Marie Henriette of Austria, the Queen of the Belgians as the wife of King Leopold II; and for Princess Marie of Hohenzollern-Sigmaringnen (once a small county in southern Germany prior to its annexation to Prussia in 1850). It was a time of nobility in Europe, when the “issue” of one royal was married off to the “issue” of another royal to bolster the back of a monarchy, especially one weakened through war, revolt, and the financial decline brought about through war and revolt. Dynastic empires were thus built and stabilized, and then stabilized and further built; and with them, the support, sponsorship and, in many instances, soaring development of the arts. That investment in art, along with a beneficent appreciation of that investment in art, and the esteem given to the national culture fostered by that art — that happy, harmonious symbiosis of artistry and affluence no longer exists in Europe, or even in the democracy of commoners known as America. Art is now very much an individual endeavour which means the artist has returned to the roots of creativity: She is on her own. The self-starter sets the bar high and makes her own measurements. She goes on her faith, which is not an illusion, that her talents are worthy of training, and worthy of reward. 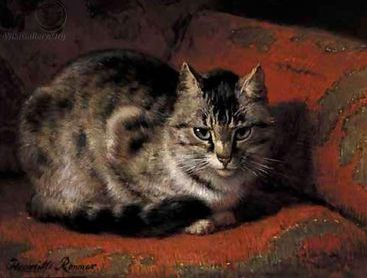 Like Henriëtte Ronner-Knip, she sees with her own eyes, not with the eyes of others. Henriëtte spent the waning years of her life at home, and in her large garden, enjoying the fruits of her life and her labor. She owned hunting dogs as well as cats and she continued her devoted painting of these beloved animals. The creative talent continued to thrive in this family as her three children, son Alfred and daughters Alice and Emma, also became artists. 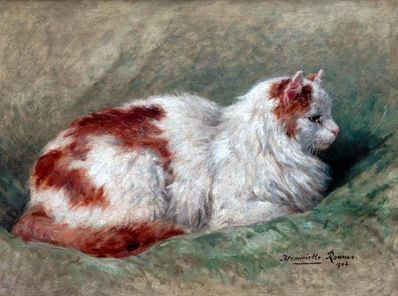 Henriëtte Ronner-Knip died on 28 February 1909 in Ixelles, Belgium. Some of her works are on display in Rijksmuseum in Amsterdam and in the National Gallery in London, but most of her paintings are in the homes of private collectors who grant to this woman the loving immortality that is always the most profound tribute to any artist.